Trick or Treat!!!!!!! So "Me and My Gang" is hosting a trick or treat freebie page until Halloween! Click on the cauldron on their page to check out all the freebies you can get! I am posting my freebie here on my blog as well as on theirs. 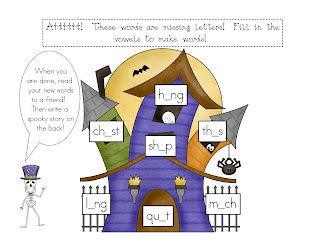 Click the picture for this great short vowel activity! This week my first graders are learning all about pumpkins! Today we went to the pumpkin farm, and on Friday we are having pumpkin day where we will have parents help with pumpkin learning stations all day. 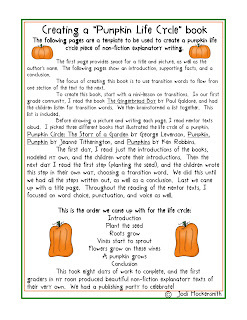 Throughout the week, we have been working on writing explanatory text about the life cycle of a pumpkin. Our district's professional development initiative this year is writing, so we have been connecting our writing to the common core standards. This explanatory text is a great introduction to writing non-fiction. The lessons and templates are below as well as the titles of the mentor texts we are using. Click below to read more! Hey everyone! I was enjoying some fall break time last week. I planned and ran our "day camp" during our school's week long intersession program during our fall break. I was so wiped out that I just came home and napped every day! Needless to say, not a lot of creating going on, but our first day back with the kiddos is tomorrow! 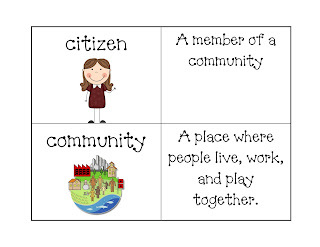 I have been working on some social studies vocabulary that we will be working on until December break. Check out the cards below! You can use them for your word wall, a memory matching game, or whatever you come up with! We are working on community, election, government settlers, and more! Thank you so much to Barbara from FirstGradeONEderful for the Versatile Blogger award! The rules for the award are to share the award with other recently discovered blogs as well as to share 7 things about yourself! 2. I am recently addicted to Pinterest. 3. I don't really wake up in the morning until my first graders walk in the door and instantly make me laugh. 4. I have two younger sisters. 5. I recently moved back in with my parents after living in downtown Chicago for 4 years. 6. My whole family is in education. Now here are the blogs I have awarded 'The Versatile Blogger" award! I love looking for inspiration on new blogs that I come across, and you should definitely check these fabulous blogs out!